A man stood along the Oakton sidewalk in front of Niles West to protest abortion and spread his Christian values Fri., Jan. 11 and Wed. Jan 16. Equipped with a megaphone, a sign depicting a fetus, and two body cameras, he was seen talking with students about his stance on religion. Ness emailed West students and faculty on Wednesday afternoon, informing them of this potential disturbance and advising them to not engage with the protester. Mohammed Ibrahim, a freshman at Niles West who came from India three years ago, encountered the protester in the morning. According to Ibrahim, the protester said “all Muslims are terrorists,” and “all Muslims should go to hell,” as well as other anti-Islamic hate speech. As a Muslim, Ibrahim took offense to the comments and reported them. Social Studies teacher D.J. Kosiba witnessed the protester on both days that he was outside of Niles West. Kosiba said that although he was supposedly not on the school’s private property, he looked out his classroom window and saw him standing by the bike racks and believes that if legal action can’t be taken, there should at least be better communication between school staff and students. In his opinion, to be safer as a school, students need to be informed of what to do under circumstances like this. “There aren’t many safe places left in the world- our school is supposed to be one of them,” Kosiba said. Kosiba added a note of support for Christian students who “practice the teachings of Jesus — to love thy neighbor” and don’t identify with the protester’s messages. 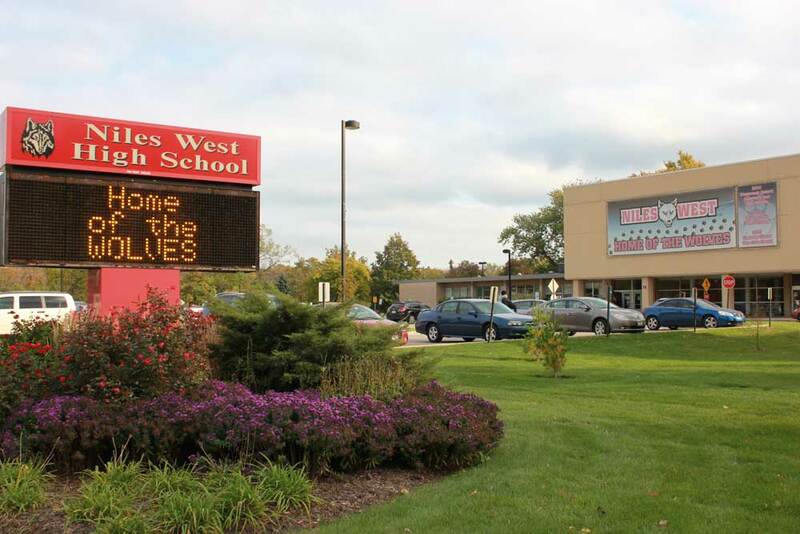 Many students felt as if Niles West was not the right place for this man to protest such politically-charged ideals. “I don’t feel it’s right to preach that sort of sentiment in front of 14-15 year-olds. Children come to school to learn about topics like biology and world history. They do not need to be exposed to the realm of politics in a place where politics and religion aren’t meant to intertwine,” junior Adem Memidzan said. Junior Cerasela Dornan agreed with Memidzan. Some students, however, are unsure about the events that took place regarding the protester. “To be honest, I don’t even know what he was saying or what it was about. I just think he should’ve done it somewhere else where he has a bigger audience who cares… like downtown, not a school,” senior Evan Han said. Some students, like senior Simon Shamoon, defended the protester on behalf of the first amendment which includes freedom of religion and freedom of speech. He believes that although the protester is being potentially disruptive, he is protected by the U.S. Constitution. “I feel like while he was preaching some controversial, possibly offensive ideas, he was allowed to do so because of the first amendment, and I respect it. I wish that our school faculty was more vocal about what’s happening in D219, and I feel like this event is a step forward in the right direction regarding faculty-to-student transparency,” Shamoon said. English teacher and yearbook adviser Sharon Swanson disagrees with the protester’s intentions. The protester has not been seen near campus since. Glad the principal is standing up for the first amendment. Rare to see educators in D219 stand up for any American values in this day and age. These kids will be berated by all sorts of protesters in college – it is just part of living life without living under a rock or being coddled. One would think the use of the bullhorn alone would have been enough to (at least) call the police for disturbing the peace? ????? Maybe that would have just added more fuel to this (off center) guy’s tank. Ignoring him is the best remedy! Note to Brandon: Educators in D219 stand up for American values every day. They just may not be YOUR version of American values. Included in the First Amendment that you celebrate is the right to express one’s own interpretation of what it means to be American and to do so without having one’s patriotism called into question.